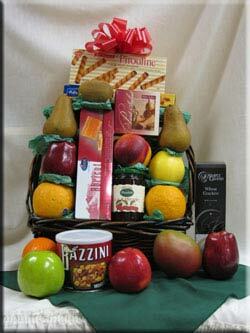 218 Haledon Ave Prospect Park NJ - Fruit and Gift Baskets since 1937! Eight pieces of extra large, extra fancy fruit arranged on top of a two pound tin of Imported Danish Butter Cookies along with cheese, crackers and Lindt Chocolate Truffles. This One is Mostly Fruit. 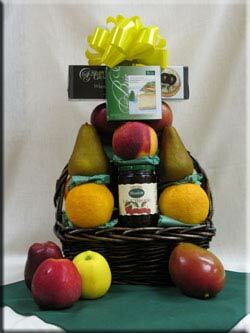 Thirteen pieces of extra large extra fancy fruit, a 12oz jar of imported preserves and a box of crackers arranged in a dark stained, hand made willow basket. 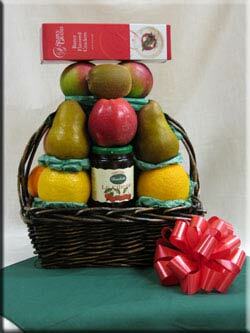 This one also has thirteen pieces of fruit arranged in a hand made willow basket along with cheese, crackers and a 12oz jar of imported preserves. 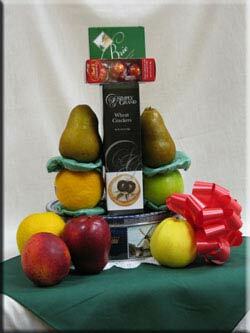 Thirteen pieces of the finest extra fancy fruit available arranged with two varieties of cheese, crackers, a 12oz jar of imported preserves and a 14oz tin of Pirouline Wafer Roll Cookies. All this in a hand made willow basket. 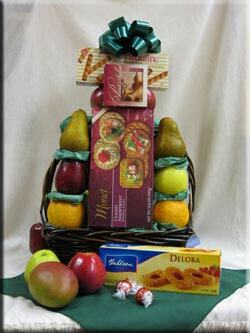 Lots of Fruit, Cheese, Crackers and Cookies! 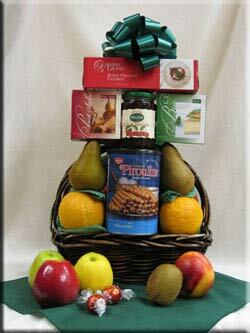 This One is Perfect for your Holiday Table! 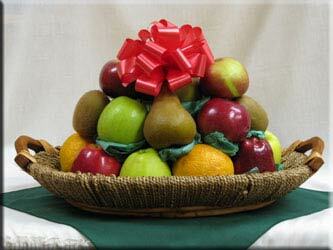 Very simply 21-23 pieces of extra large, extra fancy fruit set in a hand made oval fancy wood and sea grass tray. 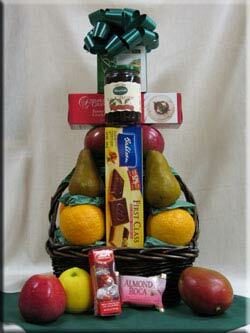 A vast array of fruit and treats overflowing a hand made willow basket. 20-22 pieces of extra large extra fancy fruit. Two 12oz cans of Bazzini Nuts, a 14oz tin of Pirouline Wafer Roll Cookies, cheese, Monet Crackers, Midor Imported Swiss Cookies, Bahlsen Imported Cookies, Ferrara Chocolate covered nuts, Almond Roca and a 2.5oz box of Pirouline Wafer Rolls. 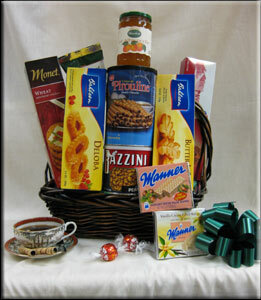 This Gourmet Basket is a nice variety arranged on a two pound tin of Danish Butter Cookies. 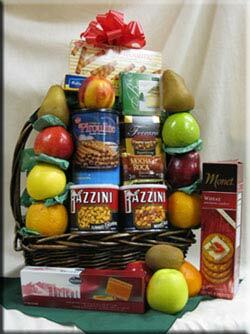 This gourmet basket also a 12oz jar of imported preserves, Bahlsen Imported cookies, a 12oz can of Bazzini Nuts, Midor Imported Swiss Cookies, crackers, Almond Roca and Lindt Chocolate Truffles. 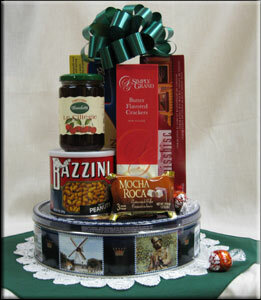 Perfect for all gift giving! 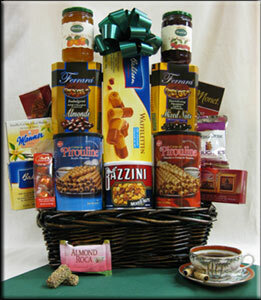 A hand made willow basket filled with two varieties of Bahlsen Imported Cookies, Monet crackers, a 12oz jar of imported preserves, Midor Imported Swiss Cookies, two varieties of Manner Wafers, a 14oz tin of Pirouline Wafer Roll Cookies, a 12oz can of Bazzini Nuts, Almond Roca, Lindt Chocolate Truffles and a pack of gourmet flavored coffee. 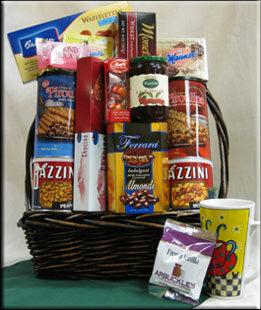 Two varieties of Prouline Waffer Roll Cookies, Ferrara chocolate covered Almonds, two varieties of Bazzini Nuts Lindt Chocolate Truffles, Almond Roca, Monet Crackers, a pack of gourmet flavored coffee, a 12oz jar of imported preserves, 2 varieties of Manner Wafers, Bahlsen Imported Cookies and Midor Imported Swiss Cookies. All in a handmade willow basket. An Amazing Abundance of Treats!